About us - Wrestling portal "Samson"
The history of sports club of Greco-Roman wrestling "Samson" begins since 2004. Adherents and great admirers of wrestling - Igor Pasivenko, Anatoly Konovalenko and Vladimir Dubina became founders of club. 1971year of birth - Master of sports. Started being engaged wrestling at the known Kiev trainer of Karmatsky V.G. The numerous winner and the prize-winner of superiority of Ukraine on Greco-Roman wrestling. Since 2007 works as the senior trainer in SC "Samson". The president of SC "Samson" is Doroshenko Vitaly. Doroshenko Vitaly (1986y.b. ), MS, winner of superiority of Ukraine and international tournaments, senior coach of the national team on Greco-Roman wrestling of Kiev on younger young men. Today in club about 100 athletes of various age groups are engaged. Pupils of club are masters of sports, candidates for the master of sports, members and candidates for national teams of Ukraine, winners and prize-winners of superiority of Ukraine, All-Ukrainian university games, the international tournaments on Greco-Roman wrestling. 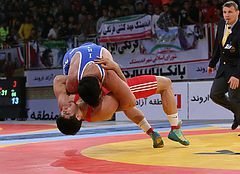 Since 2005 are carried out championships of Samson club in the Greco-roman and free-style wrestling. In 2007 founderы of SC "Samson" founded "Club League of Greco-Roman wrestling of Ukraine". The league signed the contract with Federation of Greco-Roman wrestling for a period of 10 years about carrying out all club competitions in Ukraine. The first championship of Ukraine was held on September 19-20, 2008 in Kiev. Since 2010 the Club League publishes a rating of the best wrestlers of Ukraine of the greco-roman style. 1959 year of birth. Master of sports of the USSR. The deserved trainer of Ukraine. He graduated from Military institute of physical culture in Leningrad. 1995 - 2000 senior trainer of VS of Ukraine. II place of the European championship of 2012. III place of the European championship of 2003,2010. The site of club began the work in 2005. Since May, 2010 on its pages are published not only club events, but also news of wrestling of the whole world. So it looked till November 14, 2012.